"Space challenged" is what Lyn Kmiecik calls her quilting efforts. Like many quilters, she does not have a dedicated area in which to work. And her fabric stash is sometimes difficult to access readily. But that doesn’t hold her back from creating lively, colorful quilts when she has the time. She leans toward traditional patterns in bold colors, but shies away from close handwork. Most of her projects she sends out to be professionally quilted and frequently gives them away as gifts. "I don’t consider myself an expert," she says. "I just love to do it!" With a strong artistic streak as evidenced by the many art classes she took during her college years, Lyn is an enthusiastic admirer of the quilting work of Caryl Bryer Fallert. Not surprisingly, this has helped her in designing the patchwork quilts she loves to put together. She was also particularly motivated by the program and workshop the guild presented this year featuring Pat Bishop’s unique piecing and artistic style. Lyn took her first quilting steps through a high school class that dedicated one week to the subject. Later, after growing up in Broadview, Illinois, she was determined to get her degree in computer science, which she accomplished after attending classes all over - at Calvin College in Michigan, Triton College, College of DuPage, Illinois Benedictine University, then finishing at North Central College. When she met fellow RQG member, Sue Damitz, at their place of work at Bell Labs in the 1980s, they became fast friends and started taking quilting classes together. 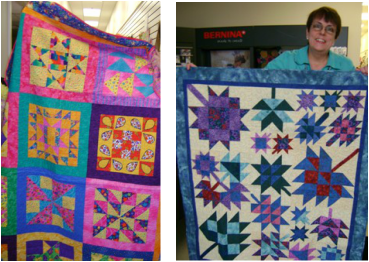 They joined Riverwalk Quilters Guild shortly after its formation in 1994. Lyn is the guild’s current Membership Co-Chair.